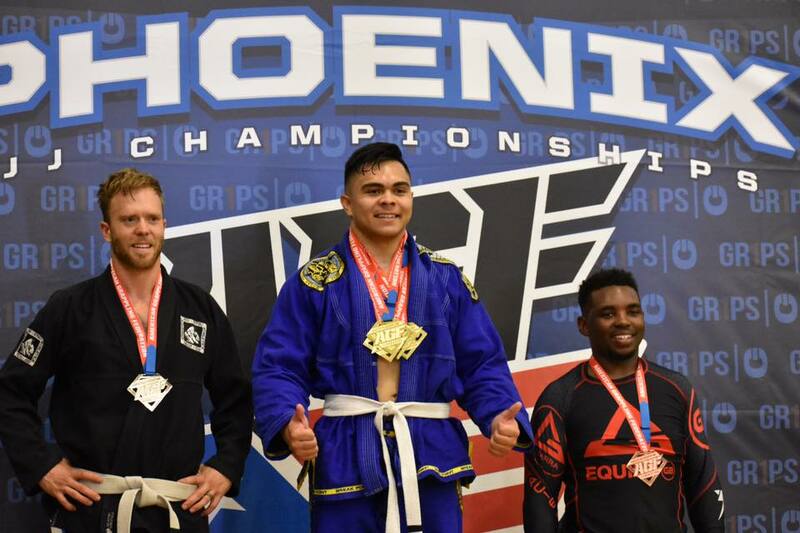 ​Jimmy House recently won the gold at the 2017 AGF Phoenix Championships. The TNT Mixed Martial Arts Training Center is so proud to count Jimmy House as one of our own! Congratulations on a job well done Jimmy! Hopefully you have read Jimmy’s bio on our Instructors web page. We asked Jimmy to give us some idea of how he obtains his goals in competitions, and how BJJ and MMA has affected his life. We believe that after reading his responses to these interview questions you will see what an amazing individual Jimmy is, and how identifying and pursuing goals in training can truly help improve your life. Why did you get involved in wrestling, BJJ, MMA, and Jiu Jitsu? The main thing that originally drew me into Brazilian Jiu Jitsu was that I was at a point in my life where I felt stagnant and I felt as though I wasn’t progressing mentally or physically as a competitor or as a human being in general. I had felt as though I was lost and needed to find a new challenge to face but I wasn’t sure what it was at the time. I was already involved in wrestling and was in the midst of starting a new diet to get my body weight down and preparing for an upcoming wrestling tournament. My friend Nick Larosa introduced me to TNT MMA and Jiu Jitsu, and I was very overwhelmed by all the new things there were to learn. Despite my initial shock I was motivated to return for my second class and I quickly developed a drive for BJJ. After about a month into Jiu Jitsu it soon became apparent to me that this would be my next challenge that I would push myself to conquer. What about BJJ do you LOVE the most? I love BJJ for many of the same reasons I fell in love with wrestling. The aspect of BJJ that I love the most is the grind. I love the training that goes into it. I crave the rigorous conditioning sessions, the brutal live rounds and the endless amount of moves and positions there are to learn. This is a sport where you are truly in control of your own path. I love being able to dictate the outcome of my success by putting in the extra time it takes to progress in this sport. I love that I am able to set short and long term goals for myself in this sport and enjoy each day and each training session. It is a sport that puts your mind to the test just as much as it does your body, if not more. What about training others do you LOVE the most? When it comes to training others I often times refer to the infamous Arnold Schwarzenegger and his “Keys to Success”. One of his keys to success is to “Give Back” or in other words put the time into people that others were generous enough to put into you. Not only is this a great way to help the sport grow and evolve but it’s a way to connect with people who are in the shoes that I once stood in not too long ago. There are certain fields of knowledge that I am able to provide my expertise in such as nutrition, strength training, conditioning, and wrestling, where I have had the honor of helping others whether it be my friends or complete strangers. At some point we all have to realize that our success is very rarely ever only to our own credit. There is always someone or something that has aided our journey to success along the way. With the credentials I have developed in each of these fields I feel very grateful to have been given the chance to share knowledge with like-minded people that could achieve just as much, or more than I have myself. What made you want to compete in BJJ? It seems as though whatever athletic endeavor I have ever pursued in life I find myself in an organized completion, often times within the first three or four months, and BJJ certainly wasn’t any exception. I’ve always tried to pride myself in being a competitor by putting my skills and determination to the test with whatever I choose to do. I truly enjoy seeing my effort in practice shown with consistent progression in each tournament. I am always satisfied with my progression but never content with where I am. How did you formulate your goals and the process of reaching these goals? What were your specific training steps and the basics of what it really takes to be number 1! One of my recent goals was to enter the 2017 AGF Phoenix BJJ Championships and take first place for Gi and Nogi in both my weight class and the absolute division. My training regimen for this competition including training anywhere from 2-4 times a day 7 days out of the week while following a strict diet that I designed for myself to get ready for upcoming photo shoots and bodybuilding competitions. I would usually have 1-2 sessions of technique or 1-2 sessions of live rolling ending with intense strength and conditioning training. Realistically, I put in anywhere from 3-5 hours of training each day leading up to this competition while balancing a long term relationship, a two part time jobs and running my own business. To many people including myself, this seems unhealthy and even more so crazy. But anyone who knows me knows that I enjoy being thought of as a little crazy when it comes to my training. I figure I might as well make the most of my time while I’m young and able to move. What is your driving force? What kept you going in order to reach the gold? When analyzing my driving force it is hard for me to come to clear consensus. Ultimately, I believe that my driving force is my ability to see the light at the end of the tunnel no matter how many road blocks are set in front of me. There is no such thing as perfect competition prep. Everyone including myself goes into preparation for competition with a plan of some sort of how they will reach their goals. However, it is almost certain that things will never go as planned; in fact I go into competition prep with the mindset that my first plan will fail. I have a mindset to not necessarily be negative but to be realistic with myself and have a Plan B, C, D, and so on ready to execute when things do not go my way. This is a huge reason why I refuse to let myself give anything less than 150% effort in anything I do because when thoughts of quitting and failing creep into my mind I always remind myself that I work too hard to quit and fold over. Although this does not relate to Jiu Jitsu, the way my high school wrestling career ended supports my strategy in overcoming adversity very well. In short, I was projected to be a state finalist my senior year of high school and many predicated that I would accomplish my biggest goal of becoming a state champion. One week before state I received a serious concussion that sent me to the emergency room and kept me out of the state tournament. With my long-time dream demolished I found myself with two choices. I could let myself crumble, point fingers and make excuses or I could accept that it wasn’t my destiny to win the state championship but I could use this lesson as my driving force for all other challenges in life. Since then I have won several national and world championships, broken several world records and taken first in several Jiu Jitsu and wrestling tournaments, using my high school wrestling experience in the back of my head reminding me to keep pushing. Everything TRULY happens for a reason. It is our job to see the positive in every card life hands us and make the most out of bad situations. People like to see others overcome adversity because it makes them believe they can do it as well. What advice can you give those with similar goals in the same sport? My advice to anyone with similar goals as me in this sport is that you should go into every new challenge with the mindset that you will fail. Failure is essential for success. In fact you should invite failure to touch you every chance it gets. Many times we as humans have a bigger fear of failure more than we have a love for success. If we are driven to succeed by the fear of failing we handicap ourselves because without failure we cannot grow and learn. With the right mindset there is truly no way to lose in this sport. There are only winners and learners. Don’t be the person who never wins because you were afraid to fail. The success will come and it’s the people who were the most stubborn in the heat of failure who often see the most success later down the road. What is your new goal now that you have won gold? Do you have another championship you have set your eyes on? What is the next progression in your career in BJJ? I don’t necessarily have any new goals after placing first in this last tournament. The only reason I say that is because bringing home four gold medals from this last tournament wasn’t specifically my major goal. Of course I wanted to win but ultimately I would have considered my goal to have been to show great progression from the first tournament I was in a few months ago. I believe that if my goal is to always progress forward from my last showing then the rest should take care of itself and if I don’t come out with a gold medal every single time then it’s only a blessing because someone was able to expose my weaknesses. This way I can continue to progress and stay on track. My next goal in the sport is to study to test for my blue belt by the end of October. Also, I do plan to test my progression at the national and international level at white belt before testing for my blue. How has TNT helped you reach your goals? What do you love most about the gym? TNT has given me the type of instruction that I need in order to hone in on my skills and progress as a submission fighter. Coach Scott Tannenbaum has gone above and beyond in helping me improve my game. He often times stays late at the gym while I am training just so I can finish my workout. He is always passing down words of encouragement and advice that only add to my motivation to get better. Along with Coach Scott, I have been learning from all the other instructors there as well as many of my peers during class. TNT has the family atmosphere that I need to be the best I can. It feels very comforting knowing that you always have the support of a whole gym behind you no matter what goal you are striving for. The only other thing I have yet to touch on are my goals and accomplishments in academics. This past May I graduated from the Glendale Community College Honors Program as well as the Phi Theta Kappa Honors Society with two associate degrees in Art and Business. In June I was accepted into the W.P. Carey School of Business at Arizona State University as well as their Prestigious Barrett Honors College. I am currently pursuing my Bachelor’s degree in Business Administration and then plan to start finishing up my Master’s degree as well. When it comes to adversity I have faced in myself I can say that it never has been very easy to overcome and deal with at times. Many times I deal with issues that I myself don’t know why they exist but they always seem to come around. But really who am I to compare and contrast the adversity I have gone through and say it is any worse or more difficult to overcome than the next person. We all deal with different types of adversity in life. What is important is how we choose to overcome it. When I feel like something is trying to stop me from reaching my potential I always try to attack the issue and never try to ignore it. It’s best that we deal with adversity by acknowledging its existence and then not allow it to hinder us from getting what we want in life. Like I stated previously, “Everything happens for a reason.” If we all hold that to be true, there is no problem that life throws our way that we won’t be ready to push through and dominate! Ridley Fitzgerald on Martial Arts is for kids too! Martial Arts is for kids too!